The Lying Spinal Twist Pose in Yin Yoga is a supported side opener, shoulder and lower back stretch. This calming pose is very beneficial for your entire core because you are supported by the floor, yet it is very energizing though the internal massage of the twist. Find your state of relaxation that is deeper than sleep, as you invite your journey inward. Release your mind, following only your breath and the subtle, yet deep opening of your body-mind-soul. This very Yin pose is one of my and my students favorites. I often use it as the final pose before resting pose of Savasana. I can just see my students melting into the pose as they allow the ground to support them. I even do this pose in bed, before getting up! It is a wonderful way to wake up your body gently, with a health-enhancing twist! It's no wonder that this pose is so popular. It calms you at the same time that it gently energizes your core, with its gentle squeeze on your organs. The pose can also be a back and shoulder opener. You can even add a neck stretch to this pose, as you shall see. Very therapeutic, all around, for your entire body! To begin the Lying Spinal Twist Pose, lie on your back and bend your knees up toward the ceiling. Your feet should be flat on the floor. 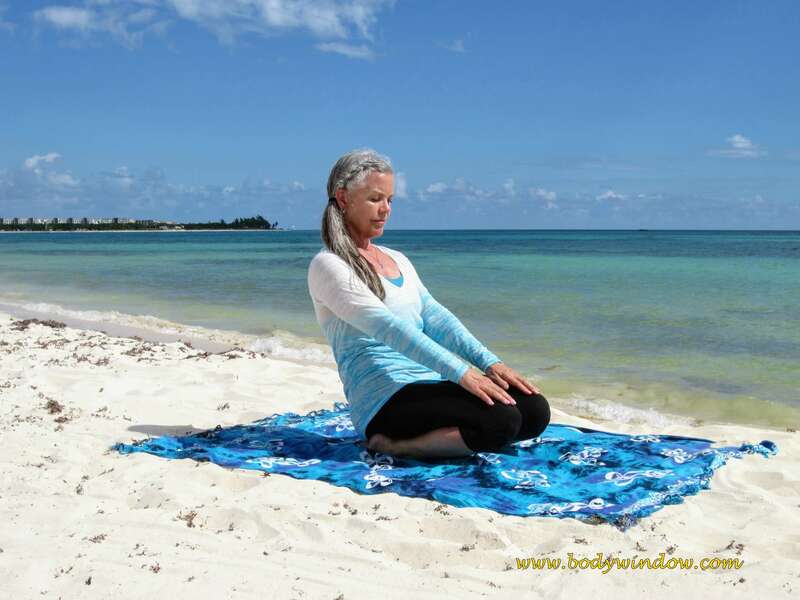 Then, ever so gently, on an exhalation, allow your knees to gently fall to the left. Your entire upper leg is stacked on top of the lower. You can see a good picture of the stacked knees in the proper twist position by clicking here on my "Bunk Bed Yoga" article. This is the easiest leg position. If you are unable to touch your knees to the floor, place a pillow or yoga bolster under your knees to rest on. Be sure to keep both shoulders grounded and flat on the floor as you twist. The tendency is to see how far you can get your knees toward the floor, and in this effort the right shoulder pops up. Keep it down, for the action of the twist to be initiated in the lower waist. Your right arm should be raised over your head. If this is uncomfortable for your shoulder, you may leave your arm(s) extended and down, or out to your sides. I like to take my left arm, and rest my hand on my knee to aid in a very gentle counter pressure for the twist, as you can see in the photo, below. If you have even more space in your right shoulder and neck, turn your head in the opposite direction of the twist, to the right, turning your head into your armpit. Not shown in the picture below, but you can even take your right hand to the crown of your head, and gently pull your head even lower towards your armpit for a lovely side stretch of the neck and upper shoulder. Notice the shift of the energy when you experiment turning your head to different sides. When you look toward your armpit, the focus is more on your upper back. If you look away from your armpit, you are focusing the stretch on your shoulder. Also experiment with how bent your knees are. If you want to give your lower back more of your energy, breath and focus, bring your knees up closer to your torso. The knees higher and toward the chest may relieve sciatica pain as well. If you want to extend the stretch to the hips and sacrum, keep your knees in line with your hips, or a bit lower. The second level of the Lying Spinal Twist, I show in the photo below. This is where I have taken my left lower leg (the one on the ground) and pulled the shin slightly back to allow the right knee to unstack and go lower toward the ground, beside the left knee. You can also wrap the lower right leg around and under the left lower leg, and do the Twisted Roots Pose, the deepest expression of the pose. Only do this if you can keep your right shoulder grounded! Or, if it feels more comfortable, you can straighten your left leg all the way instead of bending it. There are so many variations in the pose, so find the one that suits you best! But you must be able to continue with your slow, deep conscious breathing in this strong a twist, and your shoulders must be grounded at all times. Otherwise, you are just shifting your body with no additional therapeutic effect. Be sure you remain in a position where you hold only a mild edge. You can tell this by your breath. If you feel mild discomfort and are able to continue deeply and slowly breathing, you are at your first edge. You can hold the pose longer and notice more opening in your body when you stay at this first edge. Once you notice the shifting and opening, then you can go deeper to your second edge. It is always more therapeutic if you hold a mild edge for 5 minutes, than a strong edge for 30 seconds! This is the skill of doing this pose in the Yin fashion! For further instruction on how Yin Yoga differs from a more active-style Yang Yoga, see my article on Yin Yoga. To come out of the pose, bring your arms back to your sides, and on an inhale bring your knees back up into neutral, towards the ceiling. Depending on how long you have been in this pose, you may need to use your hands to assist you in bringing your knees back up. A lovely counter pose to follow up with is the Knees Into the Chest Pose. Be sure to practice this pose for equal amounts on both sides. Also, if you turn your head to each side during a single twist, make sure you do the same on the opposite side. Yoga is all about balance. The Lying Spinal Twist effects all the organs of the trunk; the heart, lungs, intestines, kidneys and urinary bladder. All twists massage and nourish these internal organs with fresh blood and energy. If practiced as described, the pose is a shoulder opener, a back and hip opener as well as neck opener. Because the pose feels so supported on the floor, the therapeutic effects happen without much noticing! What could be better? This is why I love to do the Lying Spinal Twist as part of my early morning bed yoga regiment. It helps me gently wake up and energize my body before my feet even hit the floor. 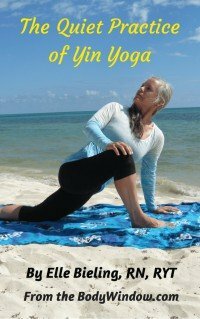 If you would love to learn more detail about how this pose nourishes the energy meridians of your body, see my teacher, Sarah Power's book called Insight Yoga. It is very descriptive of the therapeutic effects of all the Yin poses. According to Ayurvedic theory, the energy centers that are stimulated in this pose are the 2nd through the 4th Chakra energy centers. You can read more about this in my Chakra Yoga articles. May your core be supported and nourished as you do the Lying Spinal Twist Pose. May your breath bring you the deepest relaxation as you breathe new energy into your body. May you be present to all that is there for your complete healing, of your body, your mind and your soul!